St James Church church was built to replace the old St. Peters Church, which I believe was either on the grounds of, or near the cemetery, at Woodman's Point. It is a fairly young church, and has only a small cemetery on the adjoining ground. Although it is still in use, it now has a very small congregation. The records available for Westfield: Church Records, 1797-1953 (F1096) extend into St James Church time. 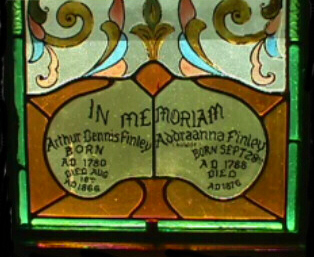 Memorial to Dennis & Adrianna (Brittain) Finley - Stainglass window in St. James Anglican Church, Westfield - View Two - An enlargement of the dedication portion at the bottom of view one. St. Peters Church (Church of England / Anglican) Westfield and Greenwich Parishes. St Peters Church was at Woodman's Point. Their records cover both Westfield and Greenwich, as well as a few records for the Anglican Church that was in Headline, Queens County listed as Welsford. There are also a few scattered records of people from Kingston Parish. This building was believed to have been situated slightly above the Saint John River in the lower half of what is now just the cemetery, and indeed there was for many years a rough area that could well be the old building site. D = 1848-1860 Baptism from p. 1 to 8, copied from the Welsford records / exact duplicates of parts of A/B/C/ = Copy not taken.